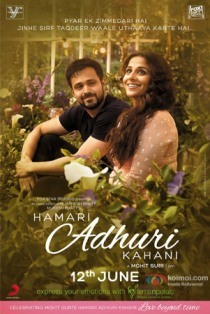 Hamari Adhuri Kahani song lyrics were penned by Rashmi Viraag , Arijit Singh was sung this in the composition of Jeet Ganguly for the film Hamari Adhuri Kahani. Hamari adhuri Kahani is a title song starring Emraan Hashmi and Vidya Balan. This film is directed by Mohit Suri. Lets enjoy the lyrics of Hamari Adhuri Kahani.